Michael Gagen, the son of Stringz Guitar Studio founder Paul, learned to play guitar in a musical household. 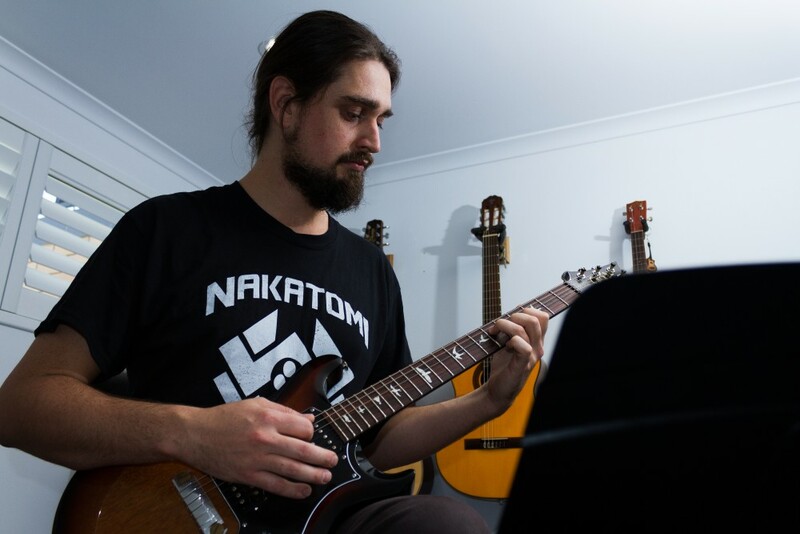 He was soon writing music, spent 10 years working in Brisbane guitar stores, (he’s probably sold you guitar strings at one point or another), playing in several bands and holds a Bachelor of Interdisciplinary Creative Industries where his principal major was music. Learning from Paul for the first 9 years of his playing, and from here going on to learn jazz guitar under the tutelage of Brisbane jazz great Rick Purdie, Mike then furthered his understanding of the fretboard, modal theory and lead guitar playing under the guidance of esteemed guitar teacher Clyde Shipke. He teaches (almost!!) 100 students per week with Stringz Guitar Studio & Stringz Kidz, and even teaches over Skype to send live guitar lessons across the planet to students everywhere from Canada to England, resulting in a full-time workload of guitar playing. He has a quiet, patient style of teaching. Michael currently works professionally with instrumental Australian post rock music groups, Echotide & hazards of swimming naked, records ambient and film music works under the moniker agrammeofsoma and his former projects include Australian progressive rock group Arcane. 2019 sees him teaching at Stringz Guitar Studio, regularly touring the country, in and out of recording studios and performing with hazards of swimming naked in almost every esoteric gig location imaginable; traversing everywhere from house parties to the QLD Gallery of Modern Art. Mike also plays piano, honestly pretty terribly. Photo by Amanda Brenchley Photography. To book a lesson with Michael, please contact us.